Iota is the ninth letter of the Greek Alphabet and is also often used to metaphorically suggest something very small. Well, our tiny white dot here is small indeed, and due to the introduction text of the developer “FATMACHINES” it’s “leaving his home and experiencing the cruel world.” What a poor, little fellow! Let’s help him to come back home asap! Anyone in for Belgian Waffles? Just within the first few seconds, “IOTA’s Journey” shows its quality. The vintage art-deco style of the level menu set a high standard for the whole game, but luckily “IOTA’s Journey” can keep it up the entire time. The graphics are really well-done, the sounds are laid back in a pleasant way and the level design meets my high expectations. Actually, the whole move-and-dodge-to-reach-the-spot-thing is similar to Vampire’s Gold and a bit like Slidey Feet, which is a good sign, since every player automatically knows what (not) to do in these games. Although “IOTA’s Journey” comes along with an intuitive gameplay, it’s still challenging as the puzzles are much more difficult as they might look at first sight. Just look at the screenshot above! See all these red arrows? Every one of them will move in the pointed direction with every step you take. Could be a bit tricky to reach the upper right corner, right? Right! It’s hard to provide some kind of constructive feedback on a game with such a high overall quality like this one. Maybe we could build a bridge to the introduction and talk about the story? I like the fact that “FATMACHINES” provides a background story for this game, but is it too much to ask for a bit more than that? 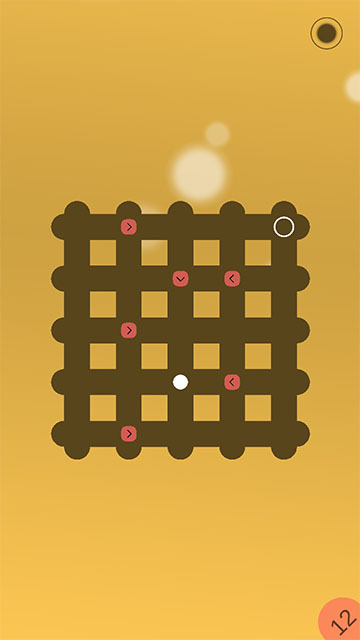 They could have named this game “Dot Puzzle” and be content to do so, but they decided to name it “IOTA’s Journey”. So, who is IOTA? And why is he leaving his home? Was he forced to do it? Why doesn’t he meet other dots on his way? Where are the dialogues? Figuratively spoken: If you put a box in an empty room, you should expect someone asking what’s inside. 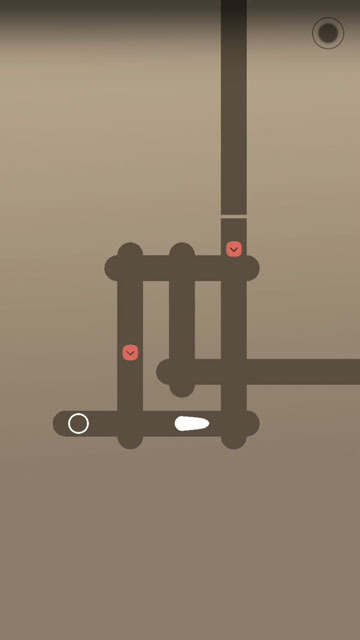 “IOTA’s Journey” is a perfectly done puzzle game. And we keep our fingers crossed, that it will also become a perfectly done adventure. No matter what it is or can be, you should download the game here. All pictures are in-game screenshots or taken from the Google Play Page of the game.